Bank stocks have helped lead the broader market lower. And some investors are worried that BofA, Citi and Goldman are among the walking dead. NEW YORK (CNNMoney) -- I don't come to praise the big banks. But I am not here to bury them either -- even though several of the larger banks are looking suspiciously zombie-like again. Like it or not, the recent sell-off in major bank stocks (while great theater) is not a good thing for the overall markets or broader economy. Bank of America (BAC, Fortune 500) has plunged 53% this year as investors continue to worry about the bank's numerous legal risks. Shares were down again Tuesday to a new 52-week low. Rumors are running rampant that BofA will have to raise capital to deal with litigation tied to pools of bad mortgage loans and/or meet international bank funding requirements. Even though BofA has steadfastly stated several times that it won't need another round of cash, the market just doesn't seem to believe the bank. Goldman Sachs (GS, Fortune 500) tumbled nearly 5% Monday on the news that its CEO Lloyd Blankfein had hired a defense lawyer to help handle government investigations into the firm's behavior during the subprime mortgage craziness. Shares fell again Tuesday. Goldman is down more than 35% this year, leading some to wonder if the so-called "vampire squid" of Wall Street is now nothing more than a batch of overly chewy fried calamari. And despite a big market rally Tuesday that included most of the financial sector, shares of JPMorgan Chase (JPM, Fortune 500), Citigroup (C, Fortune 500) and Morgan Stanley (MS, Fortune 500) are still all at or near 52-week lows as well. It appears that the United States may once again be facing the problem of having too many"zombie banks" (Bela Lugosi's dead. Undead undead undead.) that are too big to fail. That term, once used to describe Japanese lenders, became a common way to refer to big U.S. banks in 2008 and 2009. Big banks are not well enough to thrive but they are too important to completely let die. Should BofA (and HP) be kicked out of the Dow? And as long as BofA, Goldman, Citi and other unlovable financials continue to sink, they will likely serve as an albatross around the collective necks of all our 401(k) accounts and the economy. "It will be very difficult to have a vibrant economic expansion if bank capital is under attack. You just can't have it," said John Norris, managing director with Oakworth Capital Bank in Birmingham, Ala. "Banks need to be healthy to lend and for the economy to grow." Now there is some good news for banks. This still doesn't appear to be a crisis remotely like 2008. Yes, Europe is in tatters and that's raising some eerie comparisons to the last credit crunch. But most U.S. banks still are in better shape now than three years ago. The FDIC reported Tuesday that the number of lenders on its so-called problem bank list fell in the second quarter from the first quarter. That was the first decline since the third quarter of 2006. That's encouraging since it should mean the pace of bank failures will slow. What's more, credit quality for big banks has improved too. Banks did learn their lesson and have made better loans. Simply being a carbon-based life form (breathing often not required) is not enough to get you a mortgage. Research firm Keefe, Bruyette & Woods, which focuses on the financial services industry, reported Tuesday that the percentage of non-performing loans on banks' balance sheets shrunk in the second quarter. That's the sixth consecutive quarterly decline. But here's the bad news. None of this really matters until the big banks are completely free and clear from the problem loans of the subprime mortgage era. What's in your wallet? The only good bank stock. BofA is being sued left and right because of loans tied to its purchase of Countrywide in 2008. Likewise, Goldman is under the gun in Washington because of mortgage securities tied to soured loan pools from 2004 to 2008. "It's old problems and old sins." said Rex Macey, chief investment officer at Wilmington Trust in Atlanta. "But banks -- and the economy -- can remain sluggish for years to come because of this." 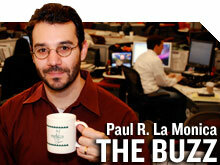 Macey said that the housing market may be stuck in the doldrums until 2015. That's clearly bad news for banks. As a result, he said that bank stocks will likely lag the broader market for a long time. Norris agreed. He said he has not bought common shares of any U.S. bank for a client since he started his firm in 2008. He thinks the big banks aren't done nursing their mortgage wounds. "We will be feeling the aftershocks of 2008 for at least another 3 to 5 years," Norris said. "The banking sector will remain soft. 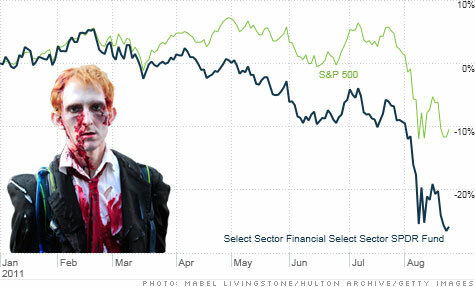 Some of the major banks could be zombies for awhile."